Thursday October 10 1907 I did some dusting and mending besides getting the dinner. I worked all afternoon at sewing the lining in my silk cloak. The new minister from [Tiffen?] called. I read most of the evening. Friday October 11 1907 I got the work done up early. Mother came out at 9.20 I sewed a little before dinner. In afternoon I finished my cloak. I walked down to the depot with mother at 4.37 I stopped at the store to get some things and began my evening work soon as I got home. I worked of tomatoes and laid them to ripen in evening. Will went to town this am with some hogs for Ed [Kover?]. Billy hauled wood in afternoon. 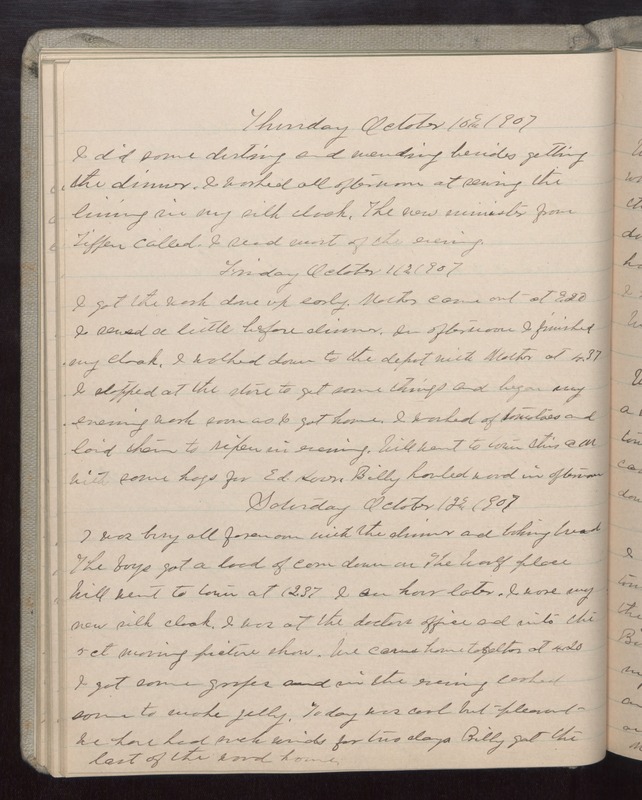 Saturday October 12 1907 I was busy all forenoon with the dinner and baking bread The boys got a load of corn down on The Woolf place Will went to town at 12.37 I an hour later. I wore my new silk cloak. I was at the doctors office and into the 5 ct moving picture show. We came home together at 4.20 I got some grapes and in the evening cooked some to make jelly. Today was cool but pleasant. We had had such winds for two days. Billy got the last of the wood home.